I've mentioned spiders on the blog before. When my children were born in England I was determined that they wouldn't be scared of spiders so I made an effort not to make a fuss if we found one in the bath. I encouraged them to hold spiders and we would carry them outside into the back garden and set them free. All the time we had them in our hands we would chat to them about how silly they were getting lost in their bathroom when they belonged in their own house outside. Now fast forward a few years and note that the Baynham family have emigrated to Australia. Yes Australia the land of many spiders. According to a website I read this morning (we all know everything on the net is true!) there are between 50 and 100 venemous species in Australia. 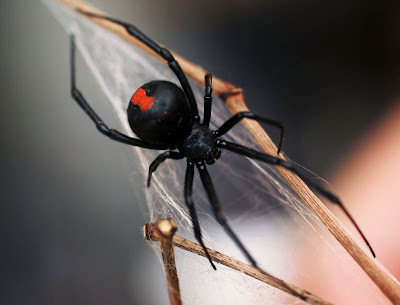 Two of which can be life thretening to humans, the red-back and the Sydney funnel web. Try if you can to imagine that I now had to undo the teaching of my kids early years. In the first few weeks of being here I had to teach them NEVER to touch a spider. Who cares if the spider has got lost and his mummy is waiting for him in the garden. Get the tin of black nothin's-gonna-live-when-sprayed-with-this Mortein from the cupboard and kill asap with no remorse. Poor confused mixed up kids. They'll need therapy in the years to come I'm sure! On the topic of red-backs, we have encountered a fair share of them but never inside the house. Ok once on the back of a chair that I had just carried in from the garden but that doesn't count really. Within confined spaces I feel safe, clean, spider free. My biggest fear is of the stories told around many an Australian kitchen table (especially to gullible tourists and newly arrived immigrants) about "the spider in the car"
There are statistics on the number of Australians killed by spiders while driving. I'm sure there must be a website dedicated to educating us about this but I can't find it just now. Apparently there have been stories about drivers losing control after a spider drops onto their lap from the ceiling or scuttles across the dash board. I don't want to be a statistic. That won't happen to me. Or will it? Byron went to drive my car this week and before the car pulled down the drive I heard him yell for the black Mortein. He had spotted a spider. Not just any spider. He had spotted a red-back.... on a web.... by the drivers feet.... Where my feet had been accelerating and braking every day this week, this month, since we bought the car 4 years ago. How long has this red-back been there? Has it had babies...????!!!! AAARRRGGHHHHHHH!!!!!! I'm with you.....I would be freaking out wondering how long that spider had been in my car!! I can' stand spiders!!! What do they need all those legs for anyway?? OMG!! I would be so freaked out if I saw this spider in real life!! Byron has saved your life... a real hero. Yeah... sell that car!! Not laughing that this hideous creature was in your car, but definitely laughing at how you unfolded the story! :) You're such a hoot! I read this one aloud to my husband, I liked it so much! And so I find myself in need of oxygen after reading this blog post as I seemed to have, inadvertently, been holding my breath.